A simple method of generating polygonal gas interfaces is proposed by using the soap film technique. Thin pins are used as angular vertexes to connect the adjacent sides of polygonal soap films in order to avoid the pressure singularities around the vertexes caused by the surface tension. As a demonstration, three polygonal interfaces (i.e., square, equilateral triangle and diamond) are created in the test section of a shock tube. Experiments are then carried out for a planar shock wave (Mach number about 1.2) interacting with air/SF6 polygonal interfaces. Numerical simulations are also performed to validate the proposed method of the interface formation. 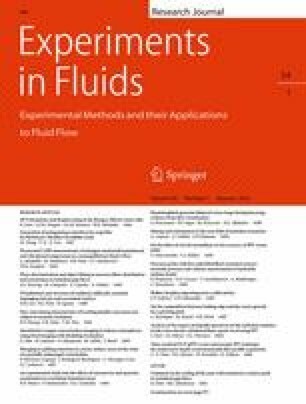 Wave systems and interface structures can be clearly identified in experimental schlieren images and agree well with the numerical results. It is also indicated that the presences of thin pins and fine chamfers only have limited effects on the interface evolution and can be ignored at the very early stage. Experimental and numerical results about the movement of the distorted interface, the width and height of the interface structures are further compared and good agreement is achieved. It is then concluded that the polygonal interface formed by the proposed method is applicable for the Richtmyer–Meshkov instability study. The work was supported by the National Natural Science Foundation of China (Nos. 10972214 and 11272308).